A natural analgesic product inspired by the traditional uses of Hawaiian medicinal plants. Lush and rich, lomi balm makes an exceptional moisturizer. LOMI BALM was created to target minor aches and pains of the muscles and joints. It is commonly used to assist in relaxing sore muscles during lomi lomi massage. Lomi lomi is a form of traditional Hawaiian massage, performed to heal mind, body and spirit of the individual. From Ancient Hawaiian temples to present day, lomi lomi styles vary, passed down from generations of tradition to anyone with a sincere desire to learn. Ingredients include: Tamanu oil, coconut oil, kukui nut oil, avocado oil, macadamia nut oil, beeswax, turmeric oil, ʻUhaloa (Waltheria americana and W. indica), Hawaiian chili pepper, ginger root, ‘Awa (Kava Kava), noni, lemongrass, passion flower. 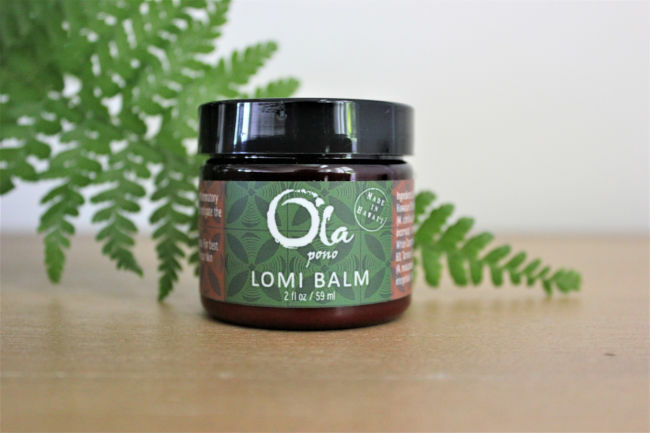 Lomi Balm is most effective when used with its sister product, Ola Pono Lomi Stick (pictured below).